Fux followers � and there are some � will have cause to welcome this latest Carus disc because it renders valuable discographic duty. The works here have only fairly recently been rediscovered and none therefore had been recorded before. Because of the nature of the works � none tied to a specific event � it�s impossible to date them with any certainty. But it�s conjecturally supposed that they were written around 1700, a period which saw him imperial court composer to Leopold I and therefore around the time he assumed the position of music director at St Stephen�s Cathedral and was elevated still further in the imperial echelon. 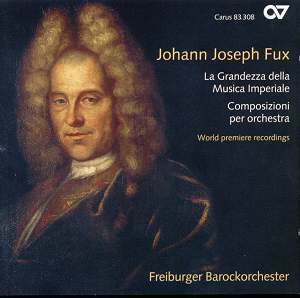 Fux is best known for his masses and oratorios, and other church music, as well as his pedagogic study Gradus ad Parnassum. �Around two thirds of his surviving oeuvre is constituted by such works. But he did write orchestral music and these five are pleasing examples of his command of dance forms, whether stylised or more personal. The Ouverture in D N4 for two oboes, two violins, viola and bass continuo is a seven-movement work of ingratiating skill. Robustly played though it is, it never quite hides the rather conventional nature of the writing � certainly in the opening. Later on nightingale evocations are to be heard and a generally improvisatory element encouraged. Just when the Minuet seems to be running out of steam the Passepied trio erupts into rude health. Experienced practitioners in the field the Freiburger Barockorcester under their violin-leader Gottfried von der Goltz refuse to linger in the Air and bring earthy vitality to the Francophile dance movements. The Concerto in D E112 is actually a more compact but emotively more personal and complex work. It veers from the external and rather showy to the more plangently reflective with some avidity. The players pick up on its chilliness as well as its seamless lines. And they are on the ball in the Fantasie third movement where we journey from avuncular to notturno introspection with rapidity. The Intrada in C is a four-movement dance based piece. This one however has a virtuosic role for violino piccolo, presumably played by van der Goltz and an accomplished if rather impersonal air all round. The Suite in C N83 is quite a brash and ceremonial affair and its French sounding leanings are confirmed in the Rondeau and in the ebullient concluding March. The final work, to round out this portrait of Fux the composer of dance music, is the little Rondeau in C.
The orchestral works don�t, it�s true, add materially to what is known of Fux. Too conventional to be stamped with any highly personalised traits they satisfy more domestic and traditional courtly needs. They are nevertheless played with vigour and understanding by the Freiburger Barockorcester and Fux Followers will need no second invitation.